WWF Wrestlemania Steel Cage Challenge 1992 By: LJN Ltd. 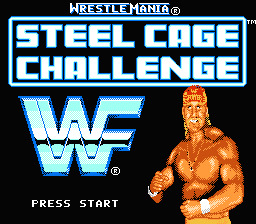 Play WWF Wrestlemania Steel Cage Challenge Now! Wrestlemania. The granddaddy of them all. The Superbowl of pro wrestling, if you will. And the steel cage...What an unforgiving structure. Two men enter it, but one man will win the watch. There is a chance, though, that neither man will be the same afterwards. Take a step back into yesteryear with the stars of the WWF, from The Immortal Hulk Hogan to Bret "Hitman" Hart to "Rowdy" Roddy Piper! Recommended...only for those with a sense of nostalgia in them. Because that's one of the few high points of this game. The graphics are less than average, even for a Nintendo game, the wrestler models looking small and somewhat blocky. The sound is alright, having the theme song for each wrestler. The game-play lacks as well in a sense, the controls being sloppy and unresponsive at times. Play only if you want a taste of nostalgic wrestling action. In this game, you have a choice of ten wrestlers to play as: The Mountie, Ted DiBiase, I.R.S, Bret Hart, Sid Justice, Randy Savage, Roddy Piper, The Undertaker, Jake Roberts, and Hulk Hogan. There are four different game modes you can play in. One On One is when you pick a wrestler of your choosing and you fight another wrestler. You can choose whether to use a steel cage or not. Tag Team is when a team of two goes at it against another team of two in tag action! In Tag Team Championship, you fight your way up a ladder of opponents in a team against other teams to win the WWF Tag Team Championship. WWF Championship is like Tag Team Championship, only with one person fighting a ladder of single opponents to win the WWF Championship. Each mode has a different difficulty, but only in One On One and Tag Team can you change it to your liking. During a match, your goal is to pin your opponent down for a three count. You do this by weakening your opponent enough by using different moves and strategies. Every match may bring new lessons, in a way, so be sure to pay attention to each match you play in!